As followers of a pagan religion, the Vikings had not one buy many Gods in their Norse Mythology. We plan to look at all the Vikings gods, to find out their role in the Viking world, and the rich and storied tellings associated with each of their gods. In ancient Norse times, the gods and goddesses were divided into three fairly unique groups, the Aesir the warriors and primary class of gods, the Vanir the gods and goddesses of fertility and the Jotun the giants. The Aesir were the primary group of gods in Norse mythology. The term Aesir literally means gods, and this group were the rulers of Asgard. The all-father Odin was the leader of the Aesir gods, and together they would rule the lives of the mortal people. The Norse gods Odin and Frigg. Odin, known as the allfather and in Norse religion he was the god of war, the chief and father to many other gods. Odin was prolific in his seduction of earthly women, Odin would visit Midgard choosing he women of his fancy. In this way Odin had many children, including Thor, Hermod and Hoder among other. Thor is one of the most well known of the Viking gods, the son of Odin and Fjorgyn, Thor was a mighty god in ancient Norse times. Simple but strong Thor was coined the god of thunder, fertility, the sky and the law, and to keep the law in order Thor would wield his mighty hammer. Loki was a mischievous fire god and also a shape shifter born to two giant parents, Farbauti and Laufey. Loki had many run ins with Thor and Odin, even causing the death of Odin’s son Baldur. Odin would later track Loki who had transformed in a salmon, and Loki was subsequently imprisoned in a cave. Tyr was a son of Odin and considered one if not the bravest of all the Viking gods. Tyr famously lost his hand by putting it into the mouth of a wolf Fenrir to distract him. Fenrir bit Tyr hand off, but the act of Tyr doing this gave the other gods time to create a magic restraint for the ever powerful Fenrir. Tyr was a god of war, and fought with the guardian hound of Helheim, Garm at Ragnarok where they both lost their life. Heimdall was the mighty guardian of the bi-frost rainbow bridge, that was the path that linked Asgard, the realm of the gods and Midgard, the realm of man. Heimdall was an imposing figure, tall and strong with a vision that was capable of keeping a watchful eye on the bridge. 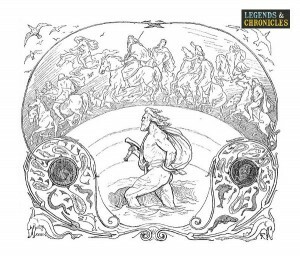 Heimdall was also the owner of the legendary horn the Gjallarhorn, often known as Gjall which if blown would be heard throughout the Norse universe alerting the Gods to come to arms. Hermod also known as Hermod the Brave, he was the son of Odin and Frigg and a member of the Aesir. Hermod is renowned for his journey to Helheim, where he attempted to save his brother Baldur. Unfortunately the terms offered to Hermod were that everyone and everything, from past and present, dead or alive should weep for Balder, then and only then would be be released by Hel. This never happened however, and Balder was kept in Helheim. Hoder was another of Odin’s sons with Frigg, and a brother to Hermod and Balder. Hoder was blind, and was indirectly responsible for the death of his brother Baldur. Baldur himself was impervious to weapons, with his only weakness being mistletoe. The blind Hoder was tricked by Loki into shooting an arrow tipped with Mistletoe at his brother Balder which fatally wounded him. Soon after this Hoders father Odin had a child, Vali with a giantess named Rindr. Vali, Hoder’s half brother grew incredibly fast into an adult and slayed Hoder in revenge for him killing Balder. Frigg was a Norse Goddesses and the most powerful of the Aesir goddesses. Frigg was married to Odin, who was the leader of the gods, and she was mother to many of Odin’s sons. Balder, Hoder, Hermod and Bragi to name a few. Frigg or Frigga as she is sometimes referred to was also the goddess of love and marriage. She had skills too, Frigg was able to see in to the future, this was how she saw the death of her son Balder. Frigg tried to protect him by making him invulnerable to everything in the Norse realms, she however overlooked mistletoe, which was what eventually killed Balder. Fulla was the Norse goddess of bounty and abundance, and she was also a member of the Aesir. Fulla is often said to be the sister of Frigg, but in other tellings she is actually her maid of sorts. Fulla would run errands, deliver messages and help Frigg wherever possible. Forseti the Norse god of justice and the son of Balder. The name Forseti basically means president and this member of the Aesir resided in a palace called Glitnir. Idun was a Norse Goddess, known as the Goddess of eternal youth and was wife to Bragi. Idun was known for her apples, that provided youth to the rest of the Gods. These apples were grown in the western garden, which Idun managed and watched over. 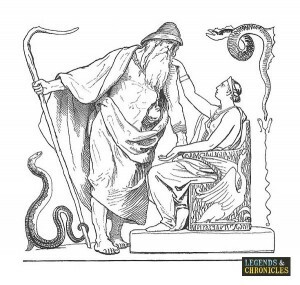 Loki ever the trickster, did launch a plan to lure Idun away, which succeeded and meant the rest of the gods began to age. Soon they approached Loki to ask him of her whereabouts, and eventually he rescued her back. Bragi was the god of poetry, the master of words and prose, and another son of Odin and Frigg. Bragi was married to Idun as we mentioned above, and was not only a poet, but a singer and player of the harp. Bragi was told from the old Norse poetry to have had runes carved on his tongue, perhaps the reason that words flowed so easily from him. Ull was the stepson of Thor and son of the Goddess Sif. Ull was also a winter god, a skier, wearer or snowshoes and a warrior and hunter. The Vanir were the ancient gods and goddesses of fertility, and one of the two primary groups of gods along with the Aesir. Later the two groups merged with some source citing the Vanir as a subgroup of the Aesir and others declaring the two now merged fully into the Aesir. Njord was the father of Freya and Freyr, and was linked with various attributes, water, wind, the sea, fishing and wealth. Njord was thought to have power to calm the weather and afford sailors and merchants save passage over dangerous waters. Njord would have children with his reported sister Nerthus, and later would marry the Giantess Skadi. One of the primary Vanir gods, Njord would later join and become a member of the Aesir. Freya was the daughter of Njord, and she was the Goddess of love, beauty and fertility. Freya was also known for her immense beauty and poise, she was simply irresistible to men, and had many affairs even though she was married. Freya was also considered to be a warrior goddess and was leader of the Valkyries. She also had a right to claim the souls of warriors, those brave Vikings that died on the battlefield, Freya would collect them and graciously allow them to spend their after life with her. Freya was originally part of the Vasir group of gods, that also included her sibling Freyr and her father Njord. The Vasir were later merged and became part of the Aesir. Freyr was the son of Njord and brother of Freya, and he was a god of the skies, of the sun and the rain. Freyr was a god that was commonly associated with farming and harvests, and also virility, marriage and prosperity. Freyr like his sister and father was also a member of the Vanir gods, who of course later merged with the Aesir group. Freyr was also given the realm of Alfheim, the land of the light elves. The Jotun were the Norse giants, who lived in the realm of Jotunheim. The Jotun were banished to live in Jotunheim by the Norse gods the Aesir, who would not allow the giants to live in their realm of Asgard. The relationship between the gods, the Aesir and the Vanir and the Jotun was often hostile, or at least spotted with troubles and conflicts, although sometimes the groups would work together. The Jotun were so many in number it would take days to go through them all, but many of the characters from Norse mythology were in fact Jotun. Characters like Aegir, Loki and Karl, were all Jotun, even though Loki is classed as a god. These three were unique because they were allowed to live in Asgard. The gods and giants of Norse mythology are nothing if not interesting and full of history. The groupings of the Aesir, the Vanir and the Jotun made up the primary classes in Viking times, all existing in their own realms in the Norse Universe. Of course sometimes these paths crossed, for better and for worse.